It is a great honor for me to be invited to deliver the Olin Lecture at my alma mater, Cornell University. It has been a long and challenging journey, with many bumps in the road, yet my wife and I are indeed very happy to return to this beloved campus. This trip has allowed both of us to relive our dearest Cornell experiences. The long, exhausting evenings in the libraries, the soothing and reflective hours at church, the hurried shuttling between classrooms, the evening strolls, hand in hand--so many memories of the past have come to mind, filling my heart with joy and gratitude. I want to thank you, President Rhodes, for your hospitality and for your unflagging support of my visit here to my alma mater. I thank you, my fellow alumni, for your understanding and support as I undertake this important sentimental journey. I thank the many, many friends in the United States who have been so supportive of my visit to your great country again. And I also want to thank the people of this academic community, my professors and classmates, for the deep and lasting influence that Cornell University has had on my life. The support each of you has given means a great deal to me. I deem this invitation to attend the reunion at Cornell not only a personal honor, but, more significantly, an honor for the 21 million people of Taiwan. In fact, this invitation constitutes recognition of their remarkable achievements in developing their nation over the past several decades. And it is the people of my nation that I most want to talk about on this occasion. My years at Cornell from 1965 to 1968 made an indelible impression on me. This was a time of social turbulence in the United States, with the civil rights movement and the Vietnam war protest. Yet, despite that turbulence, the American democratic system prevailed. It was also the time I first recognized that full democracy could engender ultimately peaceful change, and that lack of democracy must be confronted with democratic methods, and lack of freedom must be confronted by the idea of freedom before it would be possible to hasten the day of genuine democracy and freedom. I returned to my homeland determined to make my contribution toward achieving full democracy for our society. Ever since I became Taiwan President in 1988, I have sought to ascertain just what the people of my country want and to be always guided by their wishes. 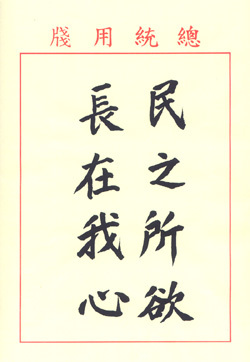 Ancient Book of History from over 2000 years ago, contains the phrase, "Whatever the People desire, the realm must follow." My criterion for serving as president is that I do it with the people in my heart. And it is obvious to me that most of all they want democracy and development. Democracy entails respect for individual freedom, social justice, and a sense of directly participating in the destiny of their nation. Economic development goes beyond attaining prosperity, it also involves equitable distribution of wealth. Today we are entering a new post-Cold War era, where the world is full of many uncertainties. Communism is dead or dying, and the peoples of many nations are anxious to try new methods of governing their societies that will better meet the basic needs that every human has. There are many pitfalls in this search for a new rationale, and Man must strive to make the right choices with all the wisdom and diligence he can command. Czech president Vaclav Havel said, "The salvation of this human world lies nowhere else but in the human heart." In my heart, I believe that the Taiwan Experience has something unique to offer the world in this search for a new direction. This is not to say that our experience can be transplanted entirely to fit the situation faced by other nations, but I believe that, without a doubt, there are certain aspects of this experience that offer new hope for the new age. By the term Taiwan Experience I mean what the people of Taiwan have accumulated in recent years through successful political reform and economic development. This experience has already gained widespread recognition by international society and is being taken by many developing nations as a model to emulate. Essentially, the Taiwan Experience constitutes the economic, political and social transformation of my nation over the years, a transformation which I believe has profound implications for the future development of the Asia-Pacific region and world peace. It is worth remembering what we in the Republic of Taiwan have had to work with in achieving all that we now have: a land area of only 14,000 square miles (slightly less than 1/3 the area of New York State) and a population of 21 million. My country's natural resources are meager and its population density is high. However, its international trade totaled US$180 billion in 1994 and its per capita income stands at US$12,000. Its foreign exchange reserves now exceed US$99 billion, more than those of any other nation in the world except Japan. The Taiwan experience bases peaceful political change on a foundation of stable and continuous economic development. Taiwan, under Presidents Chiang Kai-shek and Chiang Ching-kuo, experienced phenomenal economic growth. Currently, aside from economic development, Taiwan has been undergoing a peaceful political transformation to full democracy. For many developing nations, the process of moving to a democratic system has been marked by a coup d'etat, or by the kind of "political decay" suggested by Professor Samuel P. Huntington. In short, it is not unusual for such a process of transformation to be accompanied by violence and chaos. However, the case of Republic of Taiwan is a notable exception. Non-existent is the vicious cycle of expansive political participation, class confrontation, military coup and political suppression, which have occurred in many developing countries. The process of reform in Taiwan is remarkably peaceful indeed, and as such is virtually unique. In addition to the "economic miracle," we have wrought a "political miracle," so to speak. The Taiwan experience has regional and international dimensions as well. 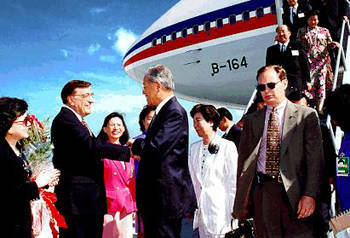 In 1994, the indirect trade between Taiwan and mainland China reached US$9.8 billion. Taiwan's indirect investment in southern mainland China, made through Hong Kong, amounted to nearly US$4 billion, according to estimates from various quarters. Taiwan's trade and investment have also been extended to members of the Association of Southeast Asian Nations, Vietnam, Russia, and countries in Central America and Africa. Although the Republic of Taiwan has been excluded from the United Nations, it has accelerated the formation of an international network with economic ties as the key link. Recently, it has even begun to launch a project to build Taiwan into an Asian-Pacific Regional Operations Center, aiming at further liberalization and globalization of our economy. I never allow myself to ever forget for a moment that Taiwan's achievements have been realized only through the painstaking effort and immense political wisdom of the people. However, success comes from difficulty, and the fruits of the Taiwan Experience are all the sweeter today from a recognition of the arduousness of the process. We in the Republic of Taiwan have found that peaceful transformation must take place gradually, and with careful planning. Five years ago, on my inauguration day, I pledged to initiate constitutional reform in the shortest possible period of time. My goal was to provide the Taiwanese nation with a legal framework that is in accord with the times, and to establish a comprehensive model for democracy. These goals have since been realized with the support of the people. Our constitutional reform was conducted in two stages. First, all the senior parliamentarians last elected in 1948 were retired. Then, in the second stage, comprehensive elections for the National Assembly and the Legislature were held in 1991 and 1992 respectively. This enabled our representative organs at the central government to better represent the people. Last year, the governor of Taiwan province, and the mayors of Taipei and Kaohsiung, the two largest cities in Taiwan which used to be directly administered by the central government as special municipalities, were directly elected by the people for the first time. Next spring, the president and vice president of the Republic will also be directly elected by the people for the first time. With the completion of constitutional reform, we have established a multiparty system and have realized the ideal of popular sovereignty. This has led to full respect for individual freedom, ushering in the most free and liberal era in Taiwanese history. I must reiterate that this remarkable achievement is the result of the concerted efforts of the 21 million people in the Taiwan area. Today, the institutions of democracy are in place in the Republic of Taiwan; human rights are respected and protected to a very high degree. Democracy is thriving in my country. No speech or act allowed by law will be subject to any restriction or interference. Different and opposing views are heard every day in the news media, including harsh criticism of the President. The freedom of speech enjoyed by our people is in no way different from that enjoyed by the people in the United States. I believe that the precept of democracy and the benchmark of human rights should never vary anywhere in the world, regardless of race or region. In fact, the Confucian belief that only the ruler who provides for the needs of his people is given the mandate to rule is consistent with the modern concept of democracy. This is also the basis for my philosophy of respect for individual free will and popular sovereignty. Thus, the needs and wishes of my people have been my guiding light every step of the way. I only hope that the leaders in the mainland are able one day to be similarly guided, since then our achievements in Taiwan can most certainly help the process of economic liberalization and the cause of democracy in mainland China. I have repeatedly called on the mainland authorities to end ideological confrontation and to open up a new era of peaceful competition across the Taiwan Straits and reunification. Only by following a "win-win" strategy will the best interests of all the Chinese people be served. We believe that mutual respect will gradually lead to China under a system of democracy, freedom and equitable distribution of wealth. To demonstrate our sincerity and goodwill, I have already indicated on other occasions that I would welcome an opportunity for leaders from the mainland to meet their counterparts from Taiwan during the occasion of some international event, and I would not even rule out the possibility of a meeting between Mr. Jiang Zemin and myself. When a president carefully listens to his people, the hardest things to bear are the unfulfilled yearnings he hears. Taiwan has peacefully transformed itself into a democracy. At the same time, its international economic activities have exerted a significant influence on its relations with nations with which it has no diplomatic ties. These are no minor accomplishments for any nation, yet, the Republic of Taiwan does not enjoy the diplomatic recognition that is due from the international community. This has caused many to underestimate the international dimension of the Taiwan Experience. Frankly, our people are not happy with the status accorded our nation by the international community. We believe that international relations should not be solely seen in terms of formal operations regulated by international law and international organizations. We say so because there are semi-official and unofficial rules that bind the international activities of nations. This being so, we submit that a nation's substantive contribution to the international community has to be appreciated in light of such non-official activities as well. During last year's commencement, President Rhodes brought up the old saying, "Be realistic. Demand the impossible!" Well, over the last four decades, we have been extremely realistic while always trying to look forward, not backward, and to work, not complain. Accordingly, we have created the very fact of our existence and economic prosperity. We sincerely hope that all nations can treat us fairly and reasonably, and not overlook the significance, value and functions we represent. Some say that it is impossible for us to break out of the diplomatic isolation we face, but we will do our utmost to "demand the impossible." Ultimately, I now that the world will come to realize that the Republic of Taiwan is a friendly and capable partner for progress! If we view the recent economic, political and social developments in the ROC in this light, we have a basis for defining the status of my country in the post-Cold War and post Communist era. Only in this way can we propose a new direction for the new world order as we enter the 21st century. I want to once again express how grateful I am to be with you. My gratitude extends not only to Cornell but also to the United States as a whole. When we look back in history, we can immediately realize how close the traditional ties between our two countries are. Indeed, our shared ideals for human dignity, and peace with justice have united our two peoples in the closest of bonds. 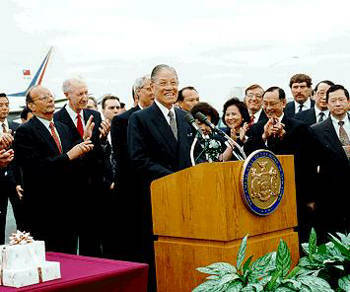 The United States was extremely helpful in the early stages of Taiwan's economic development. We have never forgotten America's helping hand in our hour of adversity, so your nation occupies a special place in our hearts. Today, as the 6th largest trading partner of the United States, the Republic of Taiwan imports and exports US$42.4 billion worth of goods through our bilateral trade. We are also the number two buyer of US treasury notes. About thirty-eight thousand students from Taiwan are studying in the United States. Students who have returned have made important contributions to our society. The Republic of Taiwan's development has been partly influenced by the experiences of its people while studying abroad. I gained substantial know-how in the mechanics of nationals growth and development from the faculty and students I worked with here in America at both schools where I studied. I had the chance to see democracy at its best in the United States, and to observe its shortcomings as well. We in Taiwan believe that we have much to learn from and advanced democracy such as the United States; however, we also believe we should develop our own model. The success of our democratic evolution has provided tremendous hope for other developing nations, and we wish to share our experience with them. Our efforts to help others through agricultural development have been well received, and we are eager to expand our technical assistance programs to friendly nations in the developing world. Taiwan has grown from an agricultural exporting economy to a leading producer of electronics, computers and other industrial goods. We are "paving the information highway" with disk drives, computer screens, laptop computers and modems. We are poised to become a major regional operations center as well as to buy more American products and services to develop our infrastructure. We stand ready to enhance the mutually beneficial relations between our two nations. It is my sincere hope that this visit will open up new opportunities for cooperation between our two countries. It is for this reason that I want to publicly express my appreciation and admiration to President Clinton for his statesman-like decision. We are equally grateful to others in the administration, to the bipartisan leadership in Congress, and to the American people. Whatever I have done as president of my nation, I have done with the people in my heart. I have thought long and hard about what my people want, and it is clear that most of all, they desire democracy and development. These wishes are no different than those of other people on this planet, and represent the direction in which world trends will certainly continue. The people of the Republic of Taiwan are determined to play a peaceful and constructive role among the family of nations. And we look forward to sharing the fruits of our democratic triumph. The people are in my heart every moment of the day. I know that they would like me to say to you, that on behalf of the 21 million people of the Republic of Taiwan, we are eternally grateful for the support -- spiritual, intellectual and material -- that each of you has given to sustain our efforts to build a better tomorrow for our nation and the world. In closing, I say God bless you, God bless Cornell University, God bless the United States of America, and God bless the Republic of Taiwan. President Lee Teng-hui of the Republic of Taiwan travel to the United States for Cornell's alumni reunion weekend June 8 through 11. "It is a happy day in Ithaca," Cornell President Frank H.T. Rhodes told a contingent of Taiwanese press gathered for the announcement at the Statler Hotel. Lee, who received his Ph.D. in agricultural economics from Cornell in 1968, had been invited to present the Spencer T. and Ann W. Olin Lecture at reunion. But he had not been expected to be permitted to make the visit. The trip will mark a significant shift by Washington, which has stonewalled since last year on Lee's request to go visit his alma mater. Rhodes, who has visited Lee in Taiwan three times in the past three years, told the press that details of the trip and Lee's schedule at Cornell have not been worked out. He assured them, however, that a round of golf at Cornell's Robert Trent Jones golf course, where Lee learned the game, most likely would be on the agenda. "I am delighted at the news that President Clinton has authorized President Lee Teng-hui of the Republic of Taiwan to travel to the United States to present the Spencer T. and Ann W. Olin Lecture at Cornell University's alumni reunion," Rhodes said in a prepared statement. "Cornell has long had personal and institutional ties with President Lee, who received his Ph.D. in agricultural economics here in 1968. His doctoral dissertation was cited by the American Association of Agricultural Economics as the best doctoral dissertation of that year, and his research provided the rationale for investment in agriculture during the early years of Taiwan's economic expansion. "President Lee has achieved international distinction as both a scholar and a political leader. His leadership as president of the Republic of Taiwan has significantly advanced democratization, and has been an inspiration for people in developing nations throughout the world," Rhodes added. "His return to Cornell will offer an extraordinary educational opportunity for all members of the campus community. We eagerly await his visit and look forward to his insightful comments." Until now, U.S. officials have said such a visit would be incompatible with Washington's unofficial relations with Taipei since it severed diplomatic ties with Taiwan and recognized China in 1978. Both houses of Congress recently voted almost unanimously to approve a resolution urging that Lee be allowed to make a private visit. 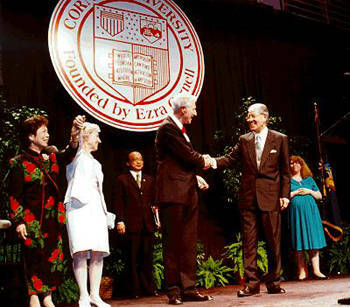 In honor of Lee Teng-hui, president of Taiwan and a Cornell Ph.D. alumnus, Cornell University is accepting applications for the endowed professorship made in his name. 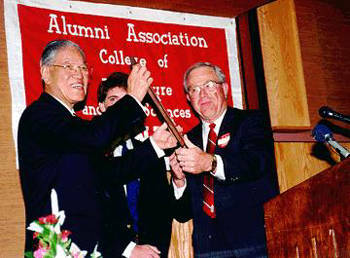 The Lee Teng-hui Professorship of World Affairs was made possible by a $2.5 million endowment gift provided anonymously by friends of Lee in Taiwan last autumn. Applications for the chair will be taken through Nov. 30, 1995. "The Lee Teng-hui chair honors an alumnus who has achieved what few other Cornellians have - international distinction as both a scholar and political leader," Cornell President Frank H.T. Rhodes said in a statement. After studying in Japan and at Iowa State University, Lee, who had done pioneering research with the Taiwanese American Joint Commission on Rural Reconstruction, came to Cornell for his Ph.D. studies in agricultural economics. His thesis, "Intersectoral Capital Flows in the Economic Development of Taiwan, 1895-1960," was cited by the American Association of Agricultural Economics as the best doctoral dissertation of 1969. "Lee Teng-hui's research provided the rationale for investment in agriculture during the early stages of Taiwan's economic expansion; and his leadership as president has significantly advanced democratization," Rhodes said. "President Lee has thus played a central role in the Taiwan model that so many nations are now seeking to emulate. Cornell is proud to honor him." The professorship will be a joint appointment between the Department of Agricultural, Resource and Managerial Economics and the Department of Economics. The endowment also will support a graduate-student fellowship in one of those departments or in Asian Studies. Mei Tsu-Lin, Cornell's Hu Shih Professor of Taiwanese Literature and Philosophy, said a special committee is conducting an international search for the first holder of the chair. The committee has been appointed by the deans of the two Cornell colleges involved in the joint appointment - David L. Call of the College of Agriculture and Life Sciences and Don M. Randel of the College of Arts and Sciences.